Welcome to the inaugural Carnival of Satire at The Skwib. This was a real pleasure to put together. As I suspected, there is some fine satire being produced by many a weblog, and I thought most of these posts were of really high quality. So no more blah, blah from me — on to the posts. Ahistoricality at Ahistoricality introduces us to a concept that makes Atkins look like a health regime for sissies in Diet of the Penguins, which also gives us our first COS graphic. As always, Laurence Simon at This Blog Is Full Of Crap produces cutting (and funny) satire; in this piece, he has a go at the US Supreme Court and the computing industry at the same time: Supreme Court Overturns Moore’s Law. Josh Cohen at Multiple Mentality brings us a good think piece (somewhere a Rolling Stone editor is wetting himself) on Where were our superheroes? Though the whole post isn’t satirical, its jumping-off point certainly is. Buckley F. Williams at The Nose On Your Face presents You Can’t Spell Urine Without U-N.
Two Dogs at Mean Ol’ Meany presents Those Damn Great Democrats Part VIII – Mary Landrieu. I love the original song, Hurricane, and this version of Dylan’s classic leaves no player in the whole Katrina debacle un-pierced. I’m sure you’ll enjoy: Here comes the story of the Hurricane. Incidentally, if you know of someone who is a Dylan imitator or stylist, Mr. Snitch wants to set the lyrics to the music. You can find out more at his website. So that’s our first outing, and a successful one at that. If you’d like to join the Carnival of Satire, you’ll find all the details here. You can also check other up-to-date carnivals at the Blog Carnival and Ferdy’s carnival form. See you next week! 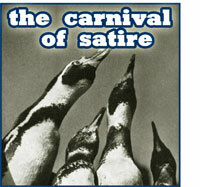 Yes, friends, it’s the Premiere Edition of the Carnival of Satire, and you can go see it over at the skwib. The Carnival of Satire is up at the skwib. This is the first shot at this carnival, give it a read.